Vintage - Sheridan Silver Company Silverplate Coffee/Tea Service - Pattern #1285 - Circa 1945 - (5) Pieces. 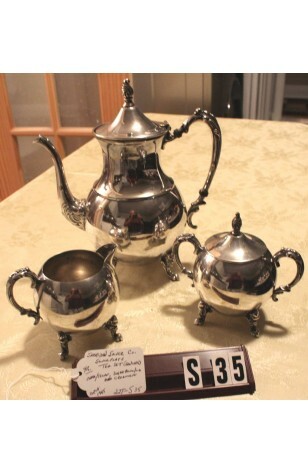 This is a lovely Silverplate Tea/Coffee Service by Sheridan Silver Co. in Pattern #1285. It consists of Coffee/Tea Pot With Lid, Sugar Bowl with Lid, and Creamer. The Service weighs approximately 5.5 pounds. All pieces are in great condition unless otherwise noted in pictures or below.